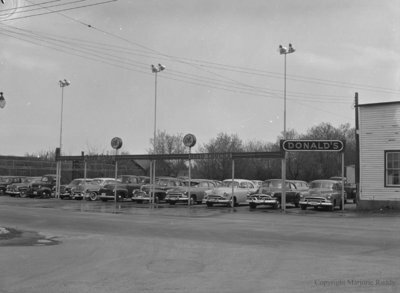 A black and white large format negative of the used car and truck lot at Donald Motor Sales. This garage was built in 1929 at the north-east corner of Dundas and Ash Street. It was known as Donald Motor Sales from 1937 to 1966. Donald Motor Sales, May 5, 1954, Marjorie Ruddy. Whitby Archives A2013_040_280.